Single 32″ HD screen, rugged flight simulator; made for maneuverability and functionality in the classroom, as well as helping to engage students in learning flight leveraging STEM concepts. From airplanes and gliders to helicopters and even drones. You have a choice of over 60 different aircrafts to fly in. Not to mention, you can explore the world with Prepar3Ds full (geographically and topographically correct) global map. Includes K-12 STEM Curriculum – Lesson Plans – Tutored Simulator Learning Missions and Assessments aligned with NGSS, CC and other standards. No prior aviation experience is necessary. Excite Future Career Opportunities in Engineering, Aviation, Coding, Air Traffic Control, Air Frame and Power Plant Repair and more. 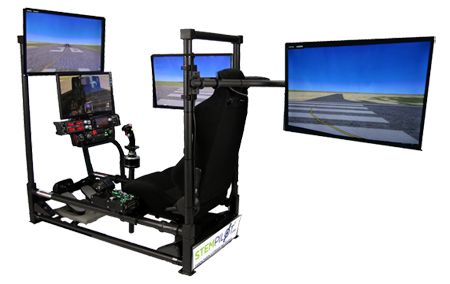 This Simulator is perfect for; STEM labs, Flying/Aviation Clubs, After school programs, Science/Physics classrooms, or an addition to a Jr. R.O.T.C. program. Paired with the included Curriculum, it has the potential to teach the principles of flight leveraging STEM concepts such as; geometry, algebra, trigonometry, physics, meteorology, geography and topography. When applied, this program is engaging to students in a way that is exciting with a video game-like experience. At the same time, it is demonstrating real-world usefulness of STEM with Project Based Learning applications in aviation. 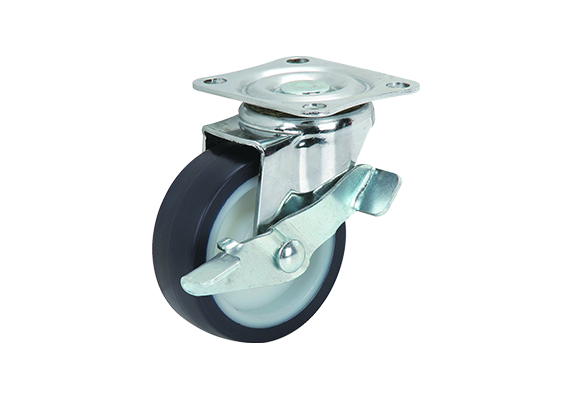 Please contact us for discounted pricing on orders of 10 or more units. Eleven custom Simulator Missions (verbally and visually tutored) loaded into a fully licensed and activated version of Prepar3D (by Lockheed Martin). 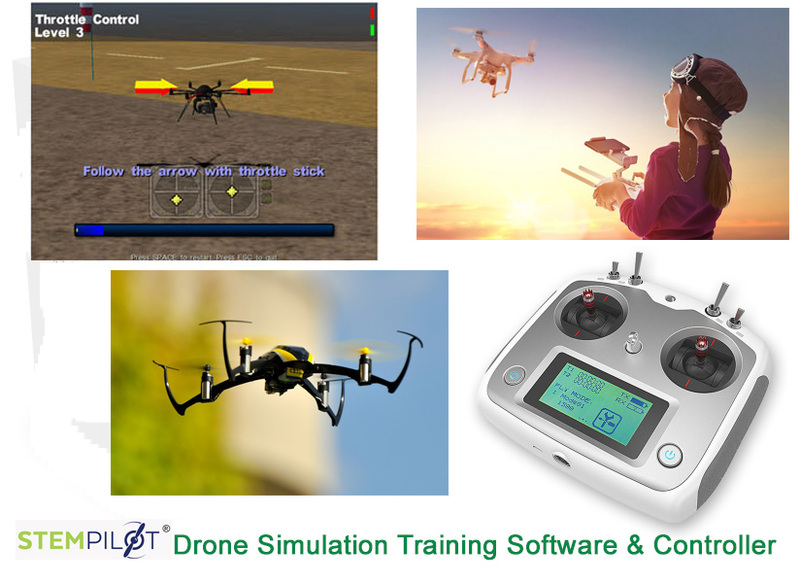 A single screen, rugged flight simulator; made for maneuverability and functionality in the classroom, as well as helping to engage students in learning flight leveraging STEM concepts. 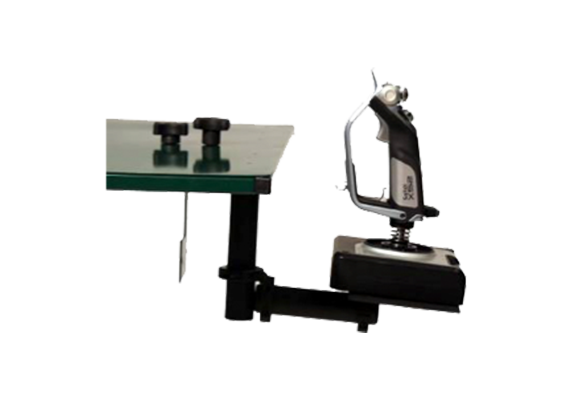 A panoramic 3 screen, rugged flight simulator; made for maneuverability and functionality in the classroom, as well as helping to engage students in learning flight leveraging STEM concepts. 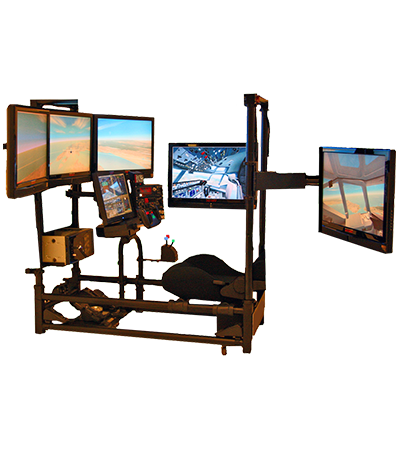 A panoramic, 3 screen, rugged flight simulator; made for maneuverability and functionality in the classroom, as well as helping to engage students in learning flight leveraging STEM concepts. Equip with an Outside/Forward View displayed on a 32 inch HD screen and a lower 22 inch screen for the Instrument/Cockpit display; our sit-in simulators are designed with a more immersive flight experience in mind, as well as helping to engage students in learning flight leveraging STEM concepts. 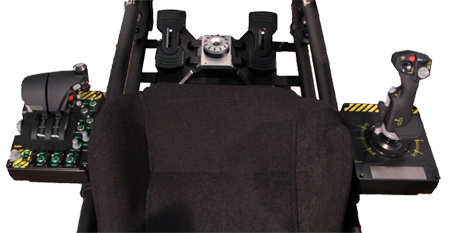 a comfortable and fully adjustable seat. All set and ready to fly on a custom built, intel core i3, Windows 7/10 PC with a 4GB DDR5 Video card. Dimensional change for Combat and Helicopter variations. Call our office for more info on mounting options and updated dimensions. Equip with a 90 inch panoramic Outside/Forward View displayed on 3 32 inch HD screens and a lower, separate 22 inch screen for the Instrument/Cockpit display; our sit-in simulators are designed with a more immersive flight experience in mind, as well as helping to engage students in learning flight leveraging STEM concepts. All set and ready to fly on a custom built, intel core i5, Windows 7/10 PC with a 8GB DDR5 Video card. Equip with an Outside/Forward View displayed on a 32 inch HD screen, a fixed 32 inch screen mounted to the right of the seat for a right window view, a 32 inch screen attached to a hinged mount on your left for a left window view and a lower 22 inch screen for the Instrument/Cockpit display; our sit-in simulators are designed with a more immersive flight experience in mind, as well as helping to engage students in learning flight leveraging STEM concepts. Equip with a 90 inch panoramic Outside/Forward View displayed on 3 32 inch HD screens, a fixed 32 inch screen mounted to the right of the seat for a right window view, a 32 inch screen attached to a hinged mount on your left for a left window view and a lower 22 inch screen for the Instrument/Cockpit display; our sit-in simulators are designed with a more immersive flight experience in mind, as well as helping to engage students in learning flight leveraging STEM concepts. All set and ready to fly on a custom built, intel core i7, Windows 7/10 PC with a 8GB DDR5 Video card. 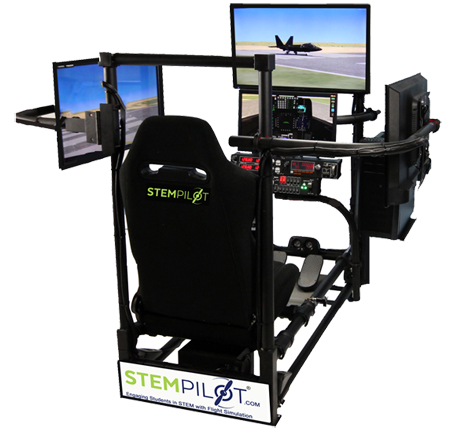 Let STEMPilot build you, your very own custom flight simulator. 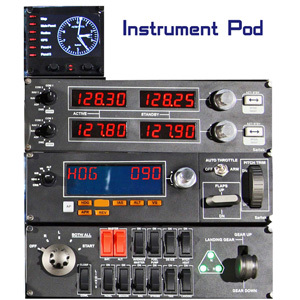 Choose between different aircraft types such as; Standard yoke controlled airplane, Combat designed aircraft, or Helicopter controls. Can’t choose just one? No Problem, we can do combination units. Or maybe you have a specific set of controls in mind, other than our standard choices. Just tell us and we will purchase and mount them to your unit. Our goal is to design a simulator that’s display and controls fit your wants and needs. From airplanes and gliders to helicopters and even drones. You have a choice of over 60 different aircrafts to fly in regardless of the type of unit you decide to buy. Not to mention, you can explore the world with Prepar3Ds full (geographically and topographically correct) global map. 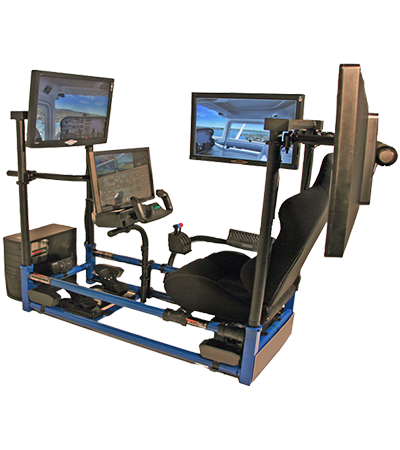 Whether you are buying this for your home or your classroom, your simulator will be an exciting and engaging way to learn. By pairing it with the included Curriculum it has the potential to teach the principles of flight leveraging STEM concepts such as; geometry, algebra, trigonometry, physics, meteorology, geography and topography. At the same time, it will be demonstrating real-world usefulness of STEM with Project Based Learning applications in aviation. 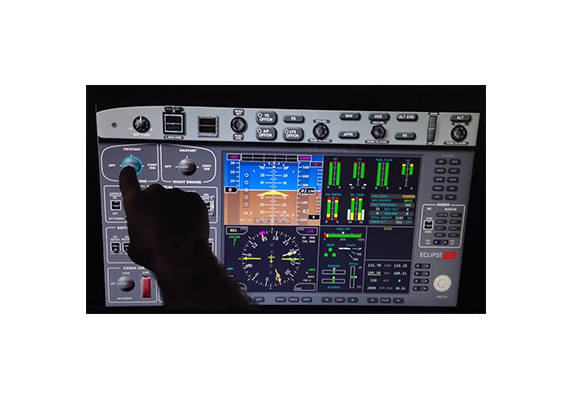 Your simulator can be customized to your needs with STEMPilot’s add-on options.